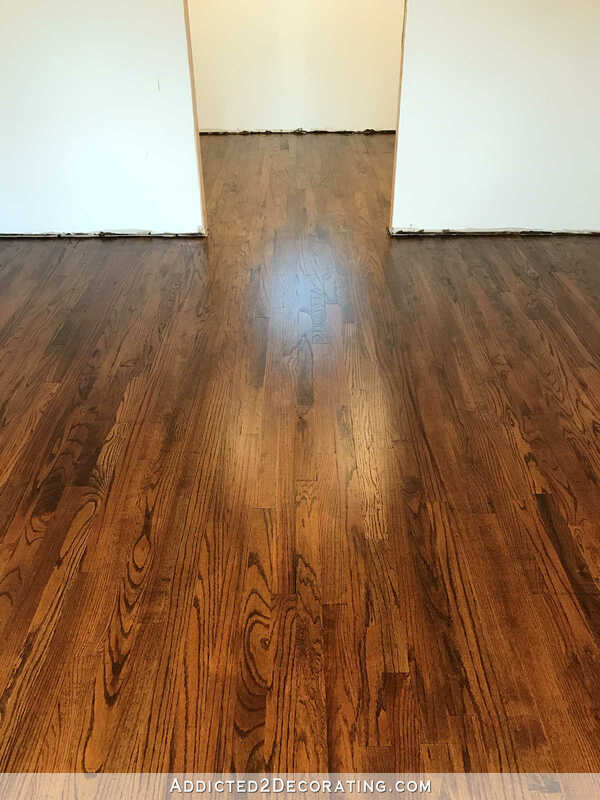 My floors are finished! 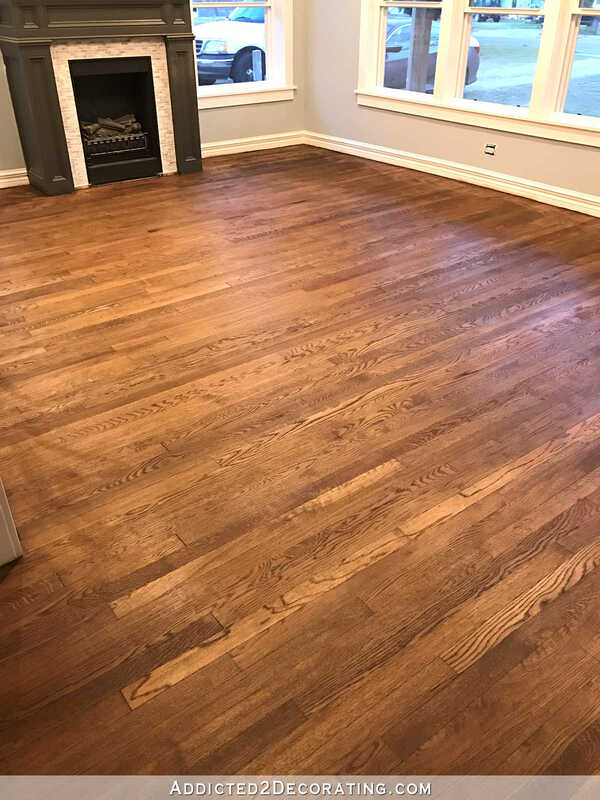 The finished floors exceeded my expectations, and I think it’s because of that poly/stain combo coat that I added to even out the color on the floor. I’m so glad I learned that trick! I’ll definitely be putting that tip to use in the future. Anyway, let’s take a look, shall we? The photos make the finish look much more reflective than it is in person. It’s really a true satin finish, so it does reflect light, but it’s not shiny. And here’s a closer view of the area under the windows. It think the poly/stain coat, and the final poly topcoat, really evened out the finish quite nicely. There’s still some variation, but once the room is furnished and decorated, I don’t think anyone will notice. And the color variations kind of blend in with the sheen variations with the light reflecting off of the finish, so it’s not really noticeable. Yikes! That’s orange! 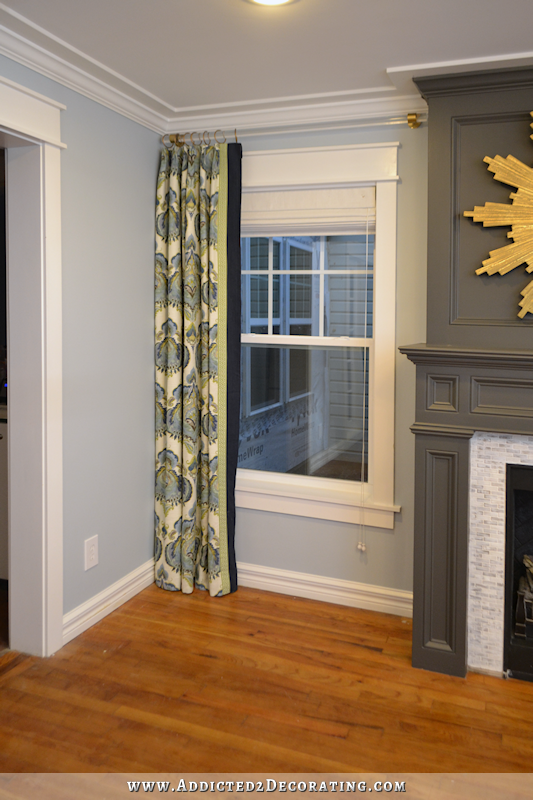 But now, here’s the same corner with the new floor color, as well as the doorway from the living room to the kitchen. …and then had to patch the floor. I only had two short pieces of old floor boards left over, so I had to mix old and new. That was at the end of 2015, so for over a year, I’ve been wondering and anxiously waiting to see if that patch job would actually look good once it was refinished. I’m so relieved to see how it turned out!! 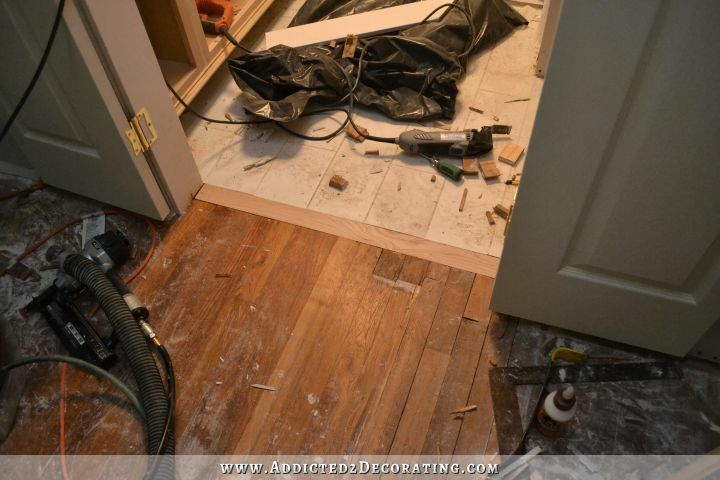 And then I had another patch job in this hallway during the bathroom remodel when I removed the small hallway closet, and then moved/widened the bathroom doorway. But as you can see, it also turned out beautifully. Wood filler, stain, and polyurethane are miracle workers! Sorry it’s so dark. I really need to get a light installed in this hallway! And then this transition from the kitchen to the living room (kitchen on bottom, living room on top) also turned out nicely. I was concerned about this one for two reasons. First, this is the most visible spot where the new floor and the old floor meet. 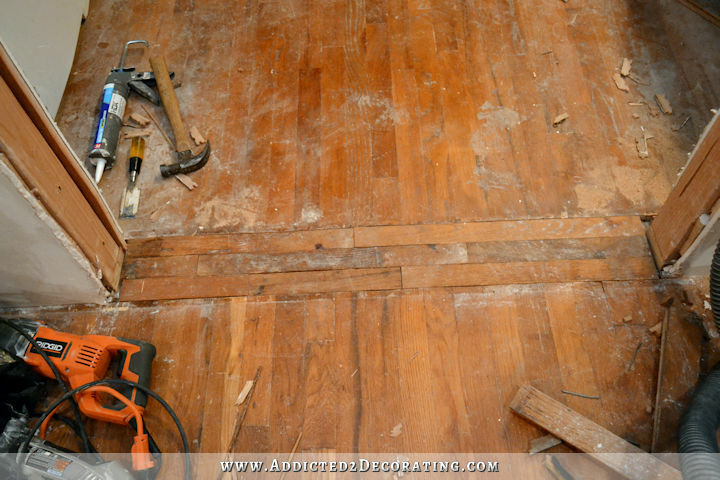 The living room floor is part of the original hardwood floor that’s almost 70 years old. 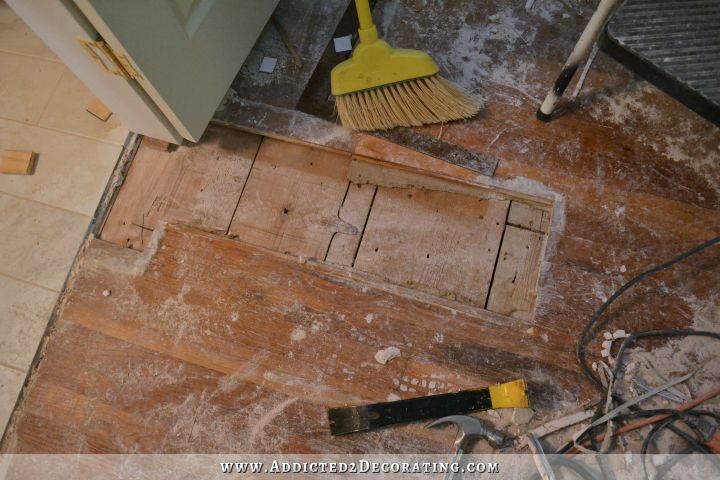 The kitchen floor is only two years old. 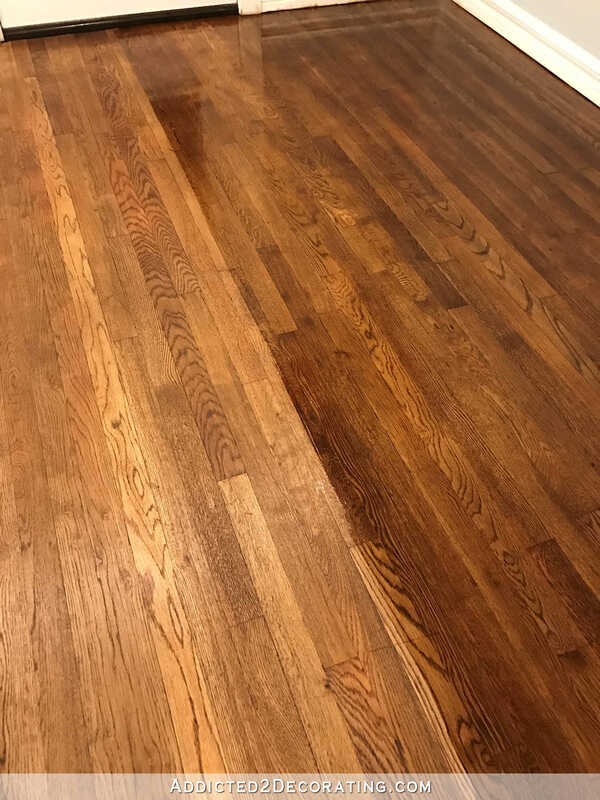 Both are red oak, but the original floor in its raw state had a more red tone to it, while the kitchen floor had a more pink/orange tone to it. But also, this was another patch job. 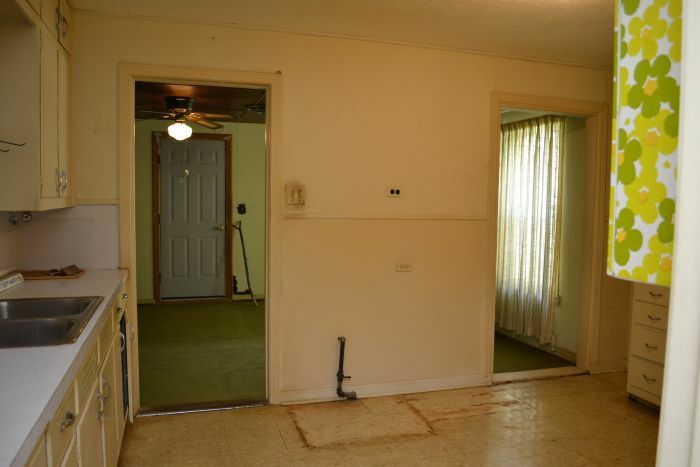 This doorway wasn’t originally here, and even when I remodeled my kitchen, it wasn’t there. It wasn’t until a year later (September 2015) that I decided to add an opening between the living room and kitchen. You can see that same transition in the bottom right corner of this photo. It’s not perfect, but I’m amazed at how good it looks, and how consistent the color is! And here’s the view from the other direction, going from the living room to the kitchen. Interestingly, my kitchen floor, which is only two years old, turned out the splotchiest of all. 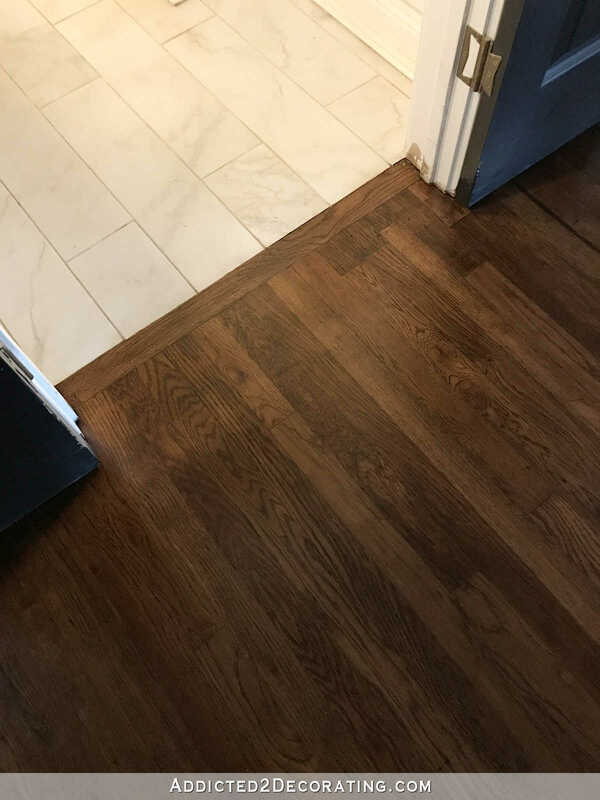 I have no idea what the issue is with that floor, but the finish just would not smooth out like it did on the old floor. 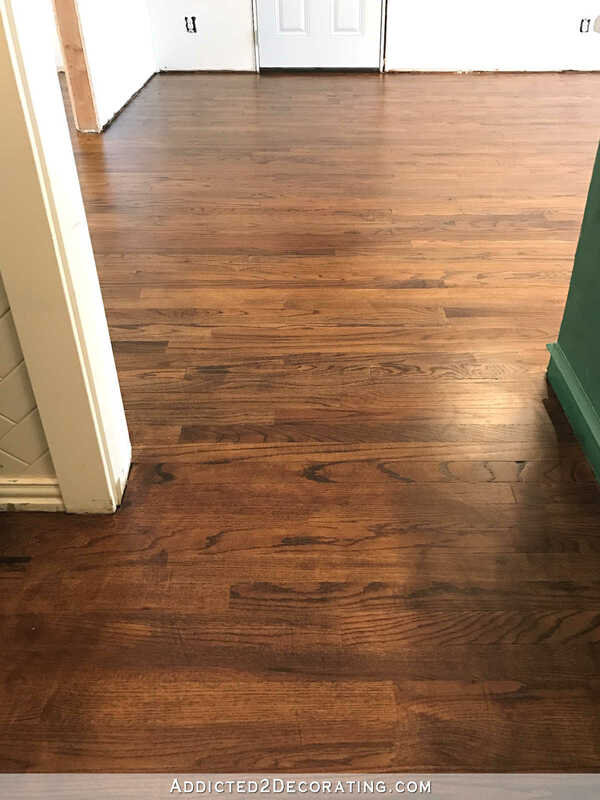 The old floor is definitely much prettier than the new floor, but when you’re actually in and walking through the house, it’s not as noticeable. 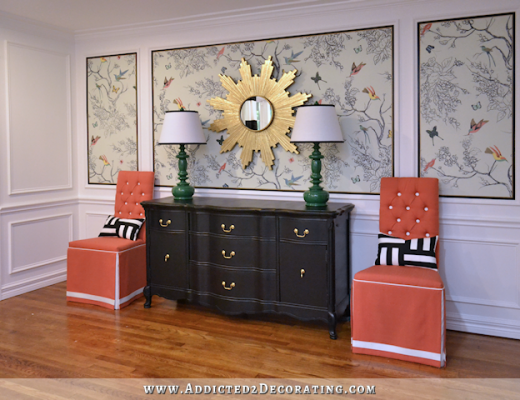 It all just kind of blends together as a beautiful backdrop for everything that will go into these rooms. But even splotchy and uneven, the current floor is 1000% better than what was originally in the kitchen. Remember the old asbestos tiles with the really rough pine boards underneath? Wow. That seems like a lifetime ago! And then finally, the breakfast room and pantry. Here’s the view from the kitchen to the breakfast room. That is where this doorway on the left used to be. 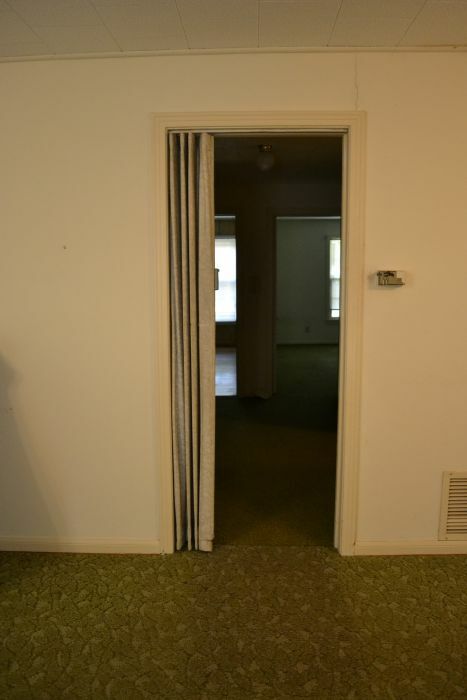 That doorway was originally an exterior door that went out onto an open, exterior breezeway that connected the house to the garage. At some point the breezeway was enclosed, but the doorway remained. And I installed new red oak hardwood floor on top of that. And now it looks like it’s always been that way. So just to recap, these are all red oak hardwood floors. 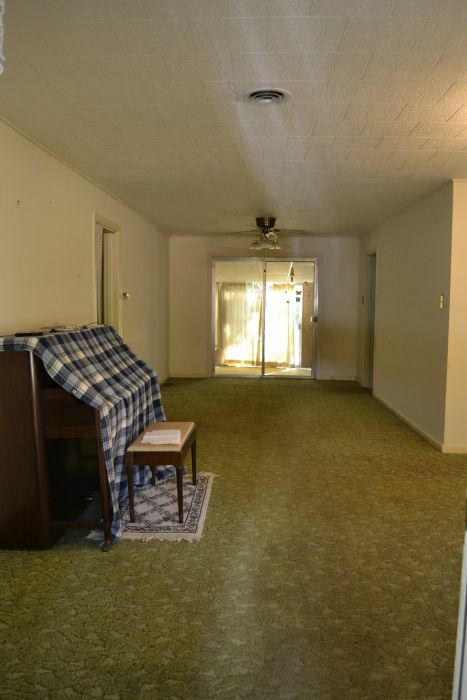 The hallway, music room, entryway, and living room are all original (almost 70 years old). The kitchen was installed two years ago, and the breakfast room and pantry were installed about three or four months ago. To even out the finish and darken it a bit more, I gave the stain overnight to dry, and then I applied a stain/polyurethane mix. (More details on that process here.) I used an 8:1 poly/stain ratio. The polyurethane I used was Minwax Super Fast Drying Polyurethane For Floors in a satin finish, and I used the same 50/50 stain mix that I had used to stain the floors. I applied this coat with an applicator pad on an extension pole, and smoothed it out with a large quality paint brush (a 3-inch Purdy) also attached to an extension pole so that I could do everything standing up. 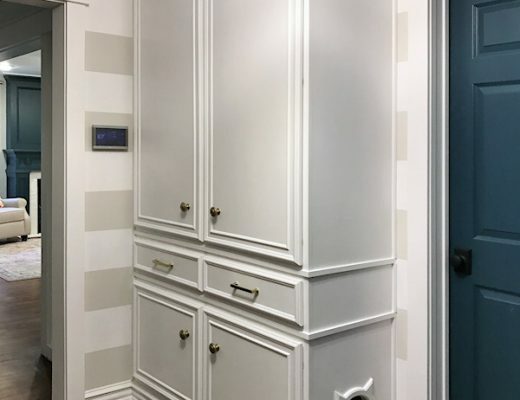 That coat darkened the finish just a bit, and also added some beautiful richness to the color. And then after that was dry (I think I gave it about ten hours), I added one final coat of polyurethane (plain poly, no stain). I applied that with a paint roller on an extension pole, and smoothed out the rolled-on poly with the same 3-inch paint brush on an extension pole as I went along. It actually went pretty fast — MUCH faster than the staining process. It was a lot of work, but so worth it to get rid of the orange that these floors had before. 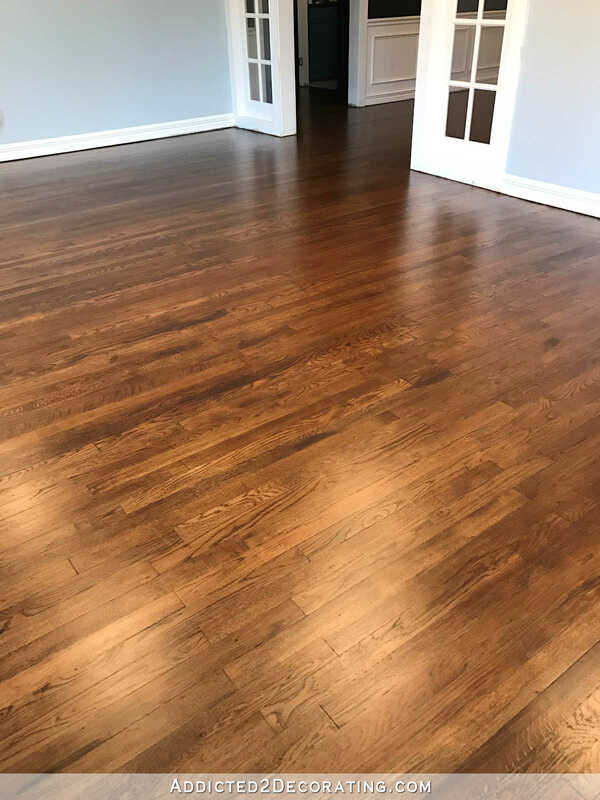 I know some people say that hardwood floors, regardless of the color, will read as a neutral so you don’t really have to consider the color in your decorating. Well, I strongly disagree with those people. 🙂 I’m so glad to be rid of the orange floors, and to now have beautiful, rich brown floors instead. My Hallway Cabinet Is FINISHED!! They look great!!! You are amazing and came up with clever solutions to all the issues you found while staining them. Can’t wait to see what you’re doing next! Beautiful floors! That’s the color I dreamt of having. A truly great job, Kristi! Congratulations! Absolutely beautiful! I love the rich, warmth that the floors now bring to your home. Your DIY adventures have inspired me to stain and paint my orange oak staircase in my 1980’s era home. Can’t wait to see the progress on the breakfast and pantry area! The floors look amazing! I can’t even tell the difference where the old floors end and the new ones begin! I LOVE THEM!!!! They look more classy and expensive. It seems like it makes a pretty big difference on the overall feel of the rooms. They are stunning! What a job, the satisfaction you must feel! Now I want to do my floors!! Thanks! I am stunned by the transformation, truly stunned. 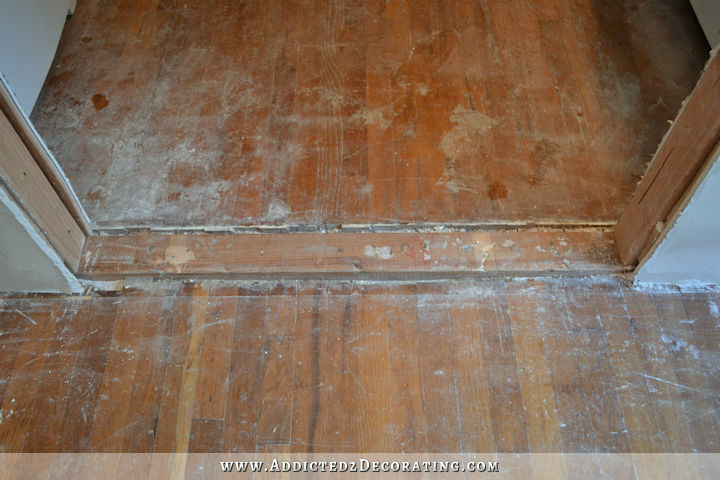 Growing up in the 50’s / Chicago area, all the homes had awful orange-yellow oak floors…I grew to HATE oak. I had no idea that they could be so beautifully transformed. KUDOS!!! Looks great. Makes me want to re-finish ours (very yellow-orange oak), but they go through the entire house and it just seems so overwhelming to move all that furniture. 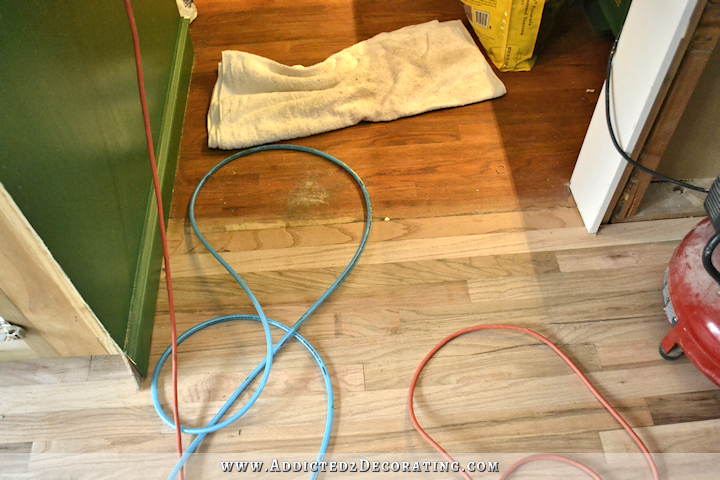 🙂 A little tip on the drop-cloth thin, when we remodeled our kitchen, we started with new oak floors and then used Ram Board, which is a roll of thin card-board. You can get it at the Home Depot. We rolled it over the floor and taped it down while we were working for weeks on everything in the kitchen. Much less of a tripping hazard than a drop cloth and probably more wheelchair friendly. Thank you! I like that idea much better than paper. Seems like it would stand up better to Matt’s wheelchair and my tools, ladders, etc. Your hubby must be so happy with nice, level floors with no obstructions. You’ve done a beautiful job. Beautiful floors! Can’t wait to see what’s next! You never stop amazing me! 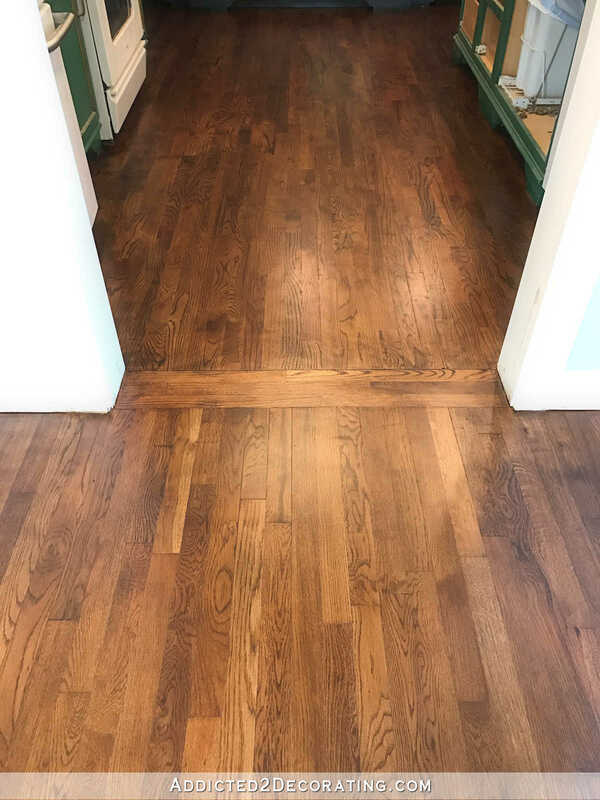 Your floors are something you can be proud of! God bless you, Kristi! Your floors are breathtakingly beautiful! You did sooo good! 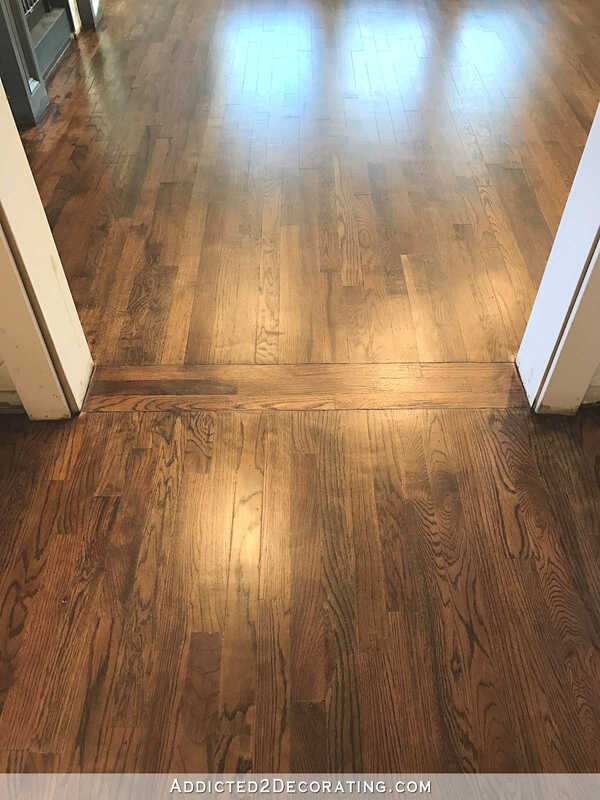 Your floors look beautiful! 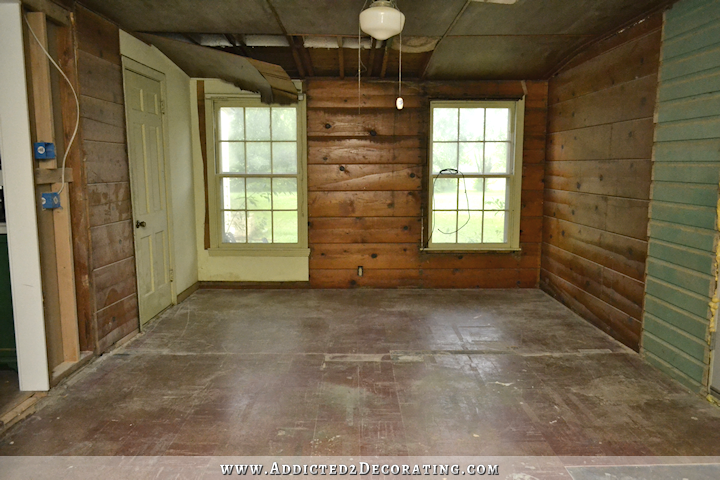 Seeing the “before” pictures, reminded me that I first started following you just after you bought this house. As I recall, there were some people (who lacked your vision) who said some nasty things about your fixer upper. You showed us all what can be done! Good for you! Those floors are beautiful! I love the color, you are truly an inspiration to us wanna be DIYers, I have learned so much from your blog and your don’t-like-it-fix-it attitude, I painted my bathroom a few months ago and I thought it was going to be gray but with the lighting in that room it looks light blue and I hate it, I’ve been afraid of repainting it since it doesn’t really need paint but I’m going to go for it, why live with something just because you put all that work into it, I’m going to go for it! Why live with it if you don’t love it! I lived with a golden sand color that I HATED in my living room, dining room and main hall for 5 years because I had just painted it and I did a very good job and the paint was fine except for the color. Then when I finally got around to re-painting I realized how it had affected my mood for those years to live in a space that I hated! It is worth the work to do it again, I promise. So beautiful! And very inspiring! Congratulations on a job well done! The floors a absolutely stunningly beautiful! I continue to be in awe of you and all you’re doing in the house. Simply amazing! Gorgeous, Kristi. The enthusiasm in your writing comes through loud and clear. The color and finish are simply beautiful! Congratulations! Hi! Great job on the floors! I have a question. In one of the pictures you mentioned there were asbestos tiles. Did you remove them yourself? what was the process if you did? I did remove my asbestos tiles myself, but that’s because they were so old (and had been installed over unprimed, raw wood) that the adhesive was no longer holding them down tightly. They just the slightest bit of prying, they popped up in whole pieces with no breakage. It’s when asbestos tiles break and send the microscopic asbestos particles airborne that causes the concern. I didn’t have that problem. 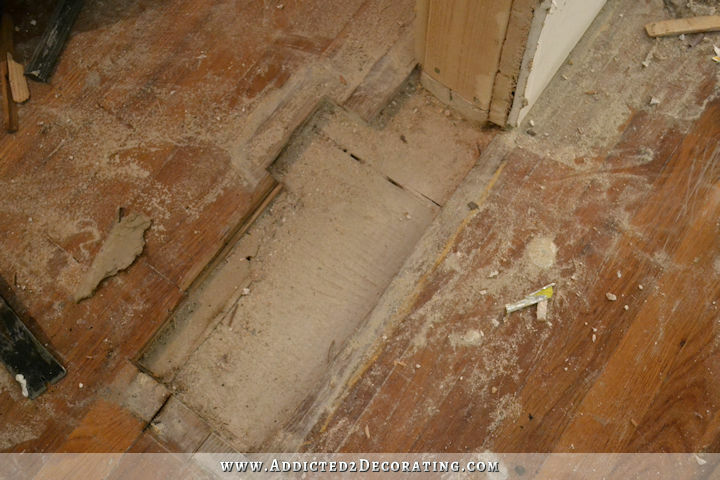 If you have tiles that don’t come up easily and in whole, unbroken pieces (and if the adhesive isn’t asbestos…I had my adhesive tested too, and it wasn’t asbestos), then you’ll need to hire a pro or encapsulate the tile (i.e., install new flooring over it without removing it). That’s what I did in my breakfast room. That room had 9 x 9 asbestos tiles, but it was a different kind — the kind that’s very dense and breaks easily. 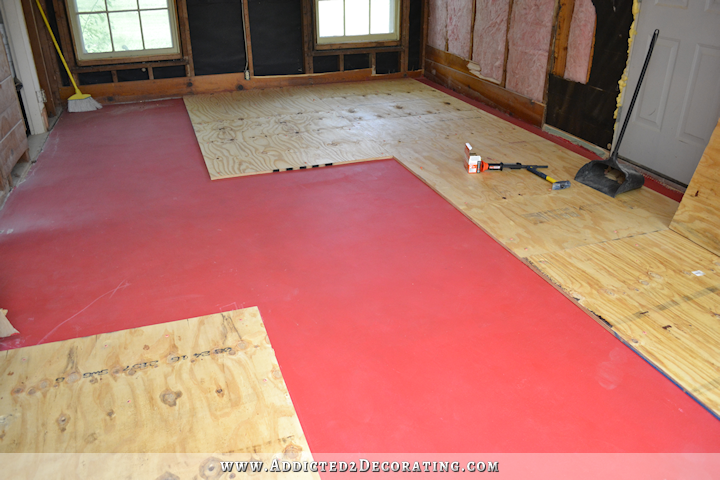 I didn’t want to spend the money to remove them, so I encapsulated them under a layer of concrete, and then installed my new plywood subfloor and hardwood floor over the new concrete. Also, I came across this beauty this morning and thought of you 🙂 ha ha – My hubs and I have read nearly all your blogs. We are such nerdy fans!! They’re gorgeous! I can’t believe the difference between the two colors. I didn’t really see the original finish as being that orange until I saw the photos side by side. You’ve done an amazing job! Wow!! It looks so fabulous! I didn’t think the old floor color was bad, but the new color looks awesome! You should feel so proud of all your hard, hard work! I would have such anxiety living in a state of construction, but so in awe of your capabilities. I would imagine life is going to feel so much cleaner and calmer for both of you! How did you identify that they were asbestos tiles and then safely remove them? I’m worried we have some in our house and have kids so I want to be very cautious about dealing with them. Wow, it looks amazing! (All the flooring) you’d never know you had to patch it or anything, it’s beautiful! “you’ve come a long way baby! !” Kristi, the floors are gorgeous!! I am so happy for you, you should be very proud!! The retrospective was revealing. I’ve been along for the ride almost since the beginning (I think – you lived at the tiny condo) and to see so much of your work – I’d forgotten how much you have accomplished. I hope you are sleeping better, Princess Fixit! Wow! You should be so proud of yourself! Look at ALL the work that YOU have done!! I’M proud of you! lol You deserve some kind of an award! You are “Fixer Upper” all by yourself! Brava! Just so so so AHmazing! Beautiful work, Kristi! Sure makes me wish I didn’t have so much furniture including a grand piano to move. Beautiful!! And love that closing statement! Lol! Get good quality dropcloths and you will learn to love them. 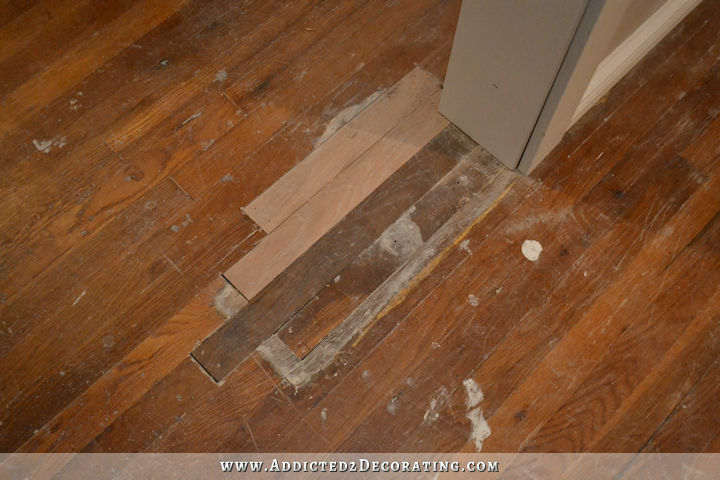 So much easier to put down and take up than refinishing floors, for sure. Great job as always! You sure had me planning to use Waterlox when getting my floors refinished though. So now I’m torn. 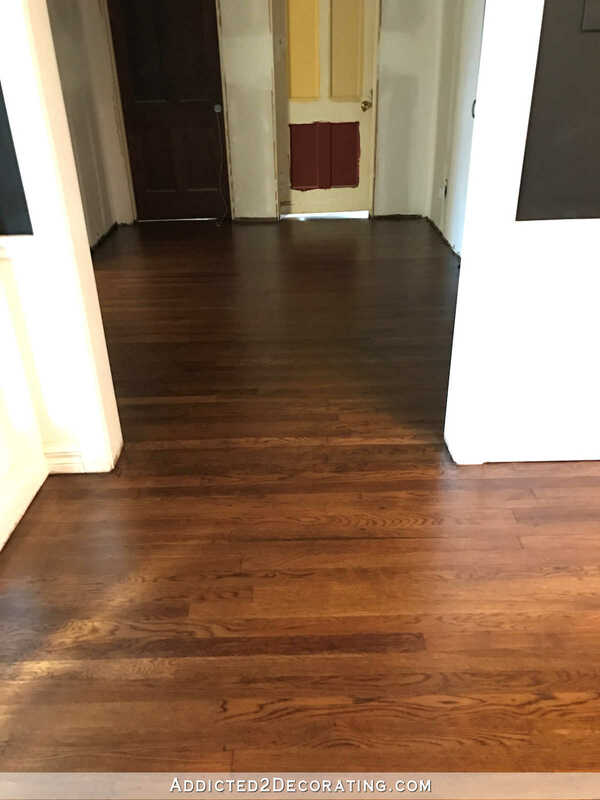 I was drawn to the maintenance of floors with Waterlox. Apparently we are hard on floors. 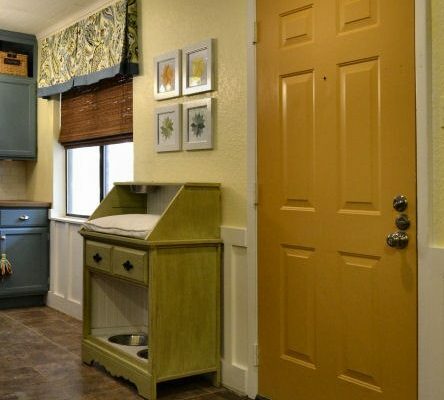 So just wondering, if it’s simply the time frame, and I have the option of living in my walk out basement with the kitchenette during the process, would you suggest sticking with the Waterlox plan? I’ve actually had several people ask me this, so I think I’ll gather my thoughts/opinions on the topic, and write a post about it. Why did you need to go over the floor with a paintbrush after you had rollered the stain on? I actually only used the paint brush after the two polyurethane coats, not with the stain coat. 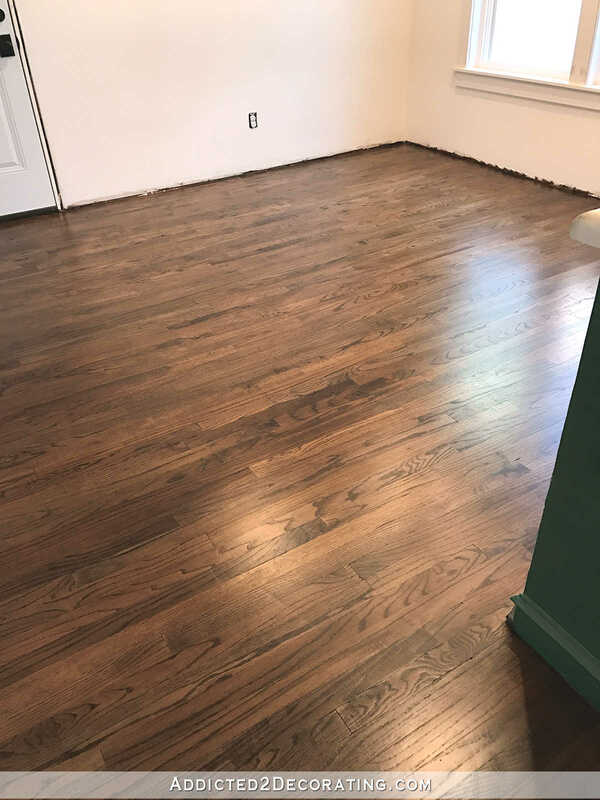 The reason I did with the first coat of poly (the poly tinted with stain) is because the applicator pad didn’t put the poly down evenly, so it was really thick and dark in places, and very light in other places. I brushed it to even out the poly/stain layer so that the color (and thickness of the poly) was consistent. On the last poly coat (polyurethane only), I applied that with a regular 3/8″ paint roller that you would use to paint your walls. I wanted to use that because it applied the poly much more consistently than the applicator pad (i.e., there weren’t thick spots and thing spots, it was just very evenly applied), but that type of roller is bad about leaving air bubbles in a polyurethane finish, so going over the poly with a brush removed the air bubbles. The floors are beautiful! No one can ever accuse you of idle hands or laziness! and will anxiously wait for each new post! I am so amazed at your transformation from a dull plain fixer upper to this warm beautiful stunning home. Your vision is spot on. It’s so nice that you share all the things you change. It makes it easier when we change our minds later to know it happens to others so just carry on. 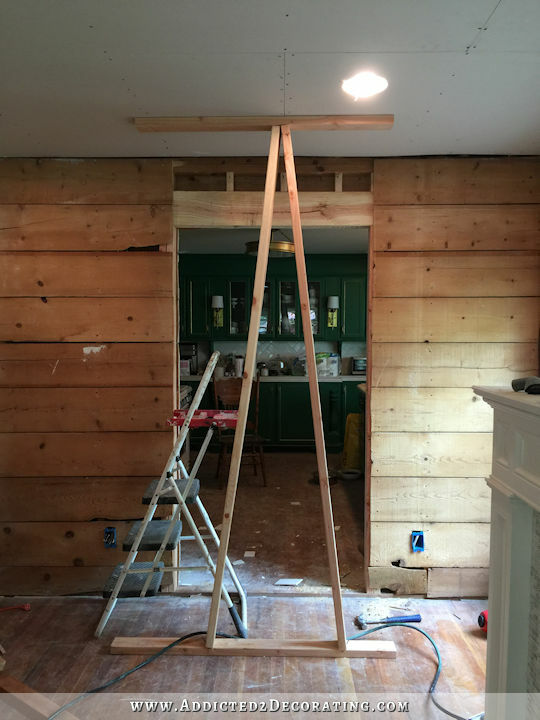 Thank you for sharing your life while remodeling. I can’t wait till each post to see the next chapter. Keep all the ideas flowing. Your floors are AMAZING!!! So pretty!! You did a great job – I know you will enjoy them! Thanks for inspiring up to keep on going with our DIY projects. I love your ideas! Did you ‘see’ this when you found your house originally? Did you imagine it could look so beautiful? Seriously; you have done an amazing reno job; and you’re not even done yet!! I’m truly truly impressed. The stain is perfect. I really did see it. No one else did. I think my mom was actually scared for me and had serious doubts, and I remember my brother walking though the house, and then looking at me with a look that told me I was out of my mind, and saying, “Well, I’m just glad it’s you and not me.” 😀 But I knew she could be beautiful! The floors are absolutely stunning – I adore them! One question as I seem to have missed that info: When and why did you decide to switch from Waterlox to poly coating? 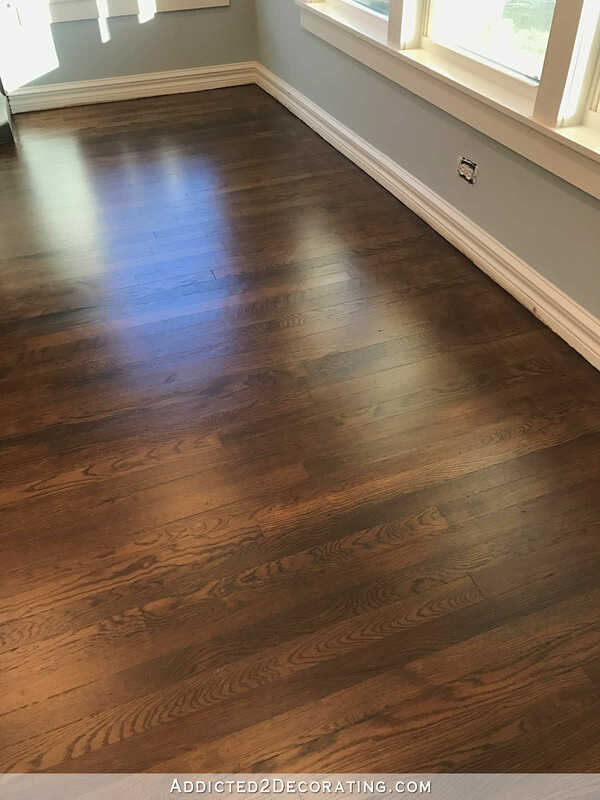 I had already decided that if we ever have to sand our wooden floor I would then use Waterlox because your way of dealing with it was so convincing (when there are scratches, it seemed so easy to get rid of them). Would you still recommend it and what made you decide against it now? I’ve had several people ask me this very question, so I think I’ll actually form and gather my thoughts and opinions, and then put the info in a post. Question for you, I realize this was your first time using the stain/poly mix but still value your opinion. I have a desk top made from pine boards that was stained and has one coat of poly on it. I’m not a huge fan of the blotchyness of the stain but was just going to live with it. What do you think would happen if the next coat of poly I apply is a stain/poly mix? Would it just sit on top since it has one coat of poly. I’m assuming I would then need to apply a third coat of just poly to cover the stain. Perfect sense, thanks for your input!! I had never heard about the no sanding if you reapply so quickly. I will definitely read the label and try that out. I’ve never done a huge staining project so sanding in between coats doesn’t take a ton of time, but would be great to eliminate if possible. 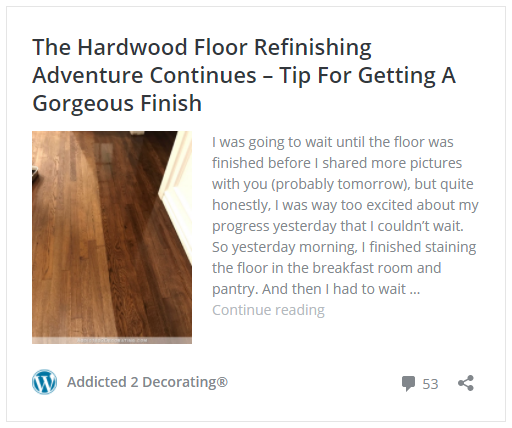 Your floors look fabulous! I love the color and the sheen. Absolutely perfect! I want to do the same thing to mine. I’ll be starting with 20 year old Bruce, prefinished floors, so there will be a ton of sanding. My biggest issue is that they have become faded, and when you lift up the edge of the rug, or move a piece of furniture, there is a huge color difference. I’m hoping that will not be visible when I sand. Do you have any experience with that? 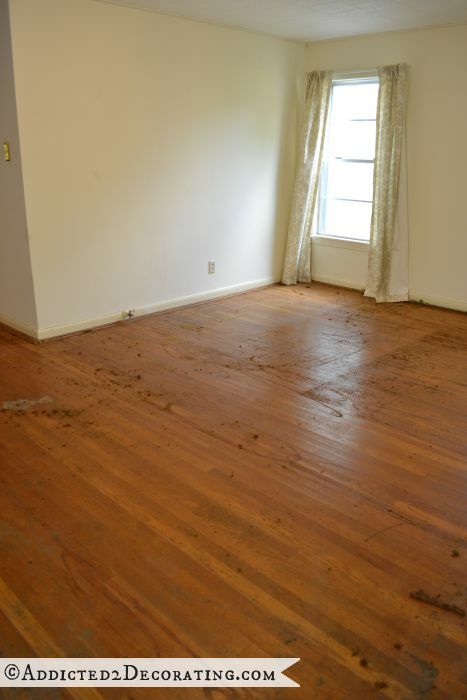 I don’t have any experience with that myself, but I would venture a guess that by the time the floors are sanded, stained, and polyurethaned, the faded areas will be gone. I wouldn’t imagine that the sun damages much below the very surface of the finished wood, so sanding should even it out. But that’s just my guess from working with wood over the years. Thanks, Kristi! I’m going to do some test sanding and keeping my fingers crossed. 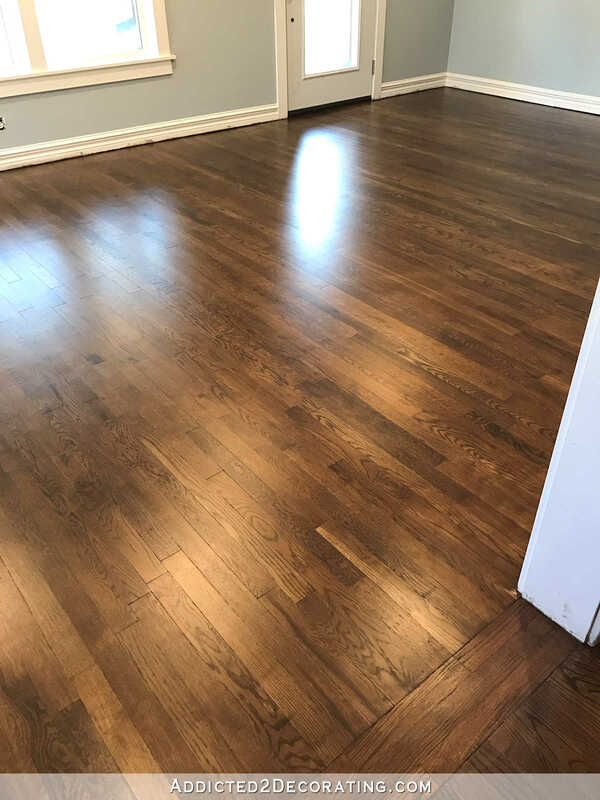 The flooring was originally gunstock color (Not my choice, but here when we bought), and the large aeras around the doors and windows are almost white with fade, if you can believe that. We also have low E/ argon windows in those areas- so much for that expensive waste of money! You inspire me daily with your lovely work. I’ll send you a photo when I’m done- thanks again! Wow! 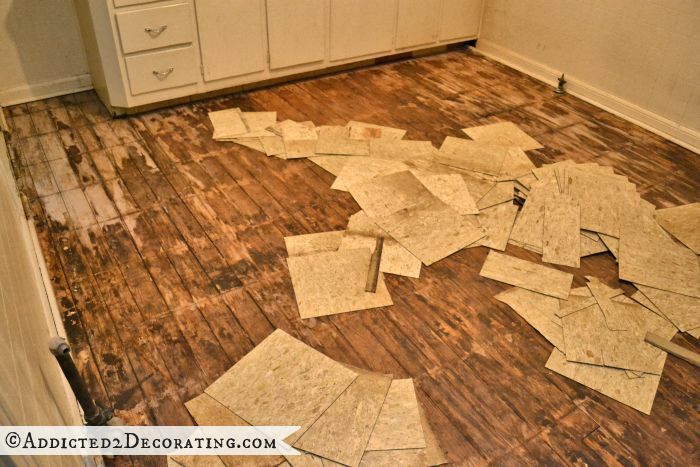 You’ve hit a home run with your floors! I love everything about them! Thank you for all the before and after photos………I hope you are amazed at what you’ve accomplished! I would never have had the vision to see the possibilities! Definitely an improvement! Perfect! Are you going to do the breakfast room decor next? I probably will. Matt is anxious for me to get that room done so that we can start eating our meals in there, and so he can have a comfy place to hang out while I’m cooking. Bravo!! Excellent job. The floors look AMAZING!!!!! So happy for you, your floors are beautiful. Congratulations! Absolutely beautiful floors! Your home is going to be beautiful and when it is finished you will not know what to do with yourself. You have tackled some really hard jobs. I hope you can rest come Spring and enjoy your work. You go girl! Stunning! Absolutely breathtakingly beautiful ! You did it!!! You are an amazing and inspiring woman, Kristi! 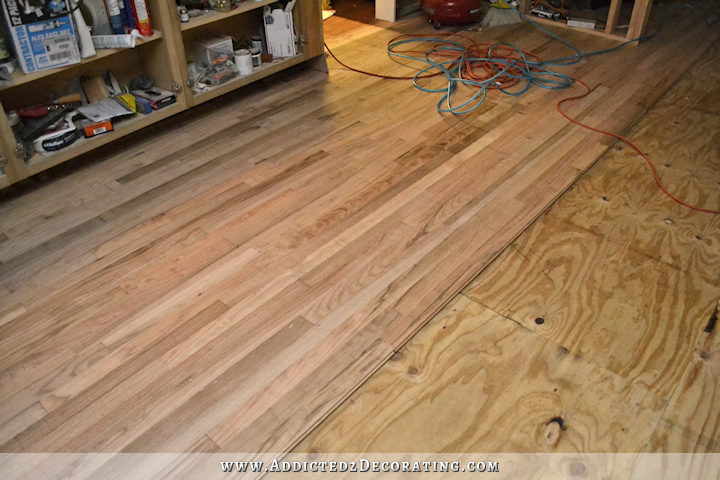 Your floors are perfect and I have no doubt that you’ll have even more fun now as you pull your decor together. I do have one question, it doesn’t look like you taped off the floor molding. My least favorite thing to paint is paint existing floor molding, especially as I don’t want to make a mistake and get paint on the floor. Do you have a plan or method for that task? I’m glad to read that you’ll be working on your breakfast room next. 🙂 Again, great job! 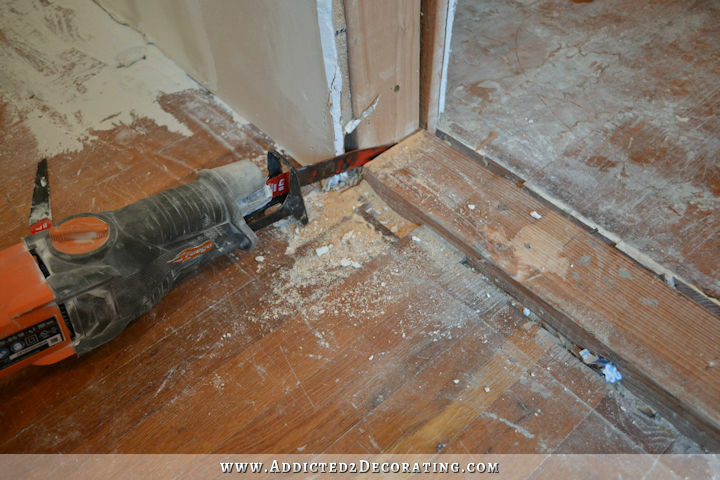 I’ll actually be adding shoe moulding (or actually, probably quarter round) to the baseboards. 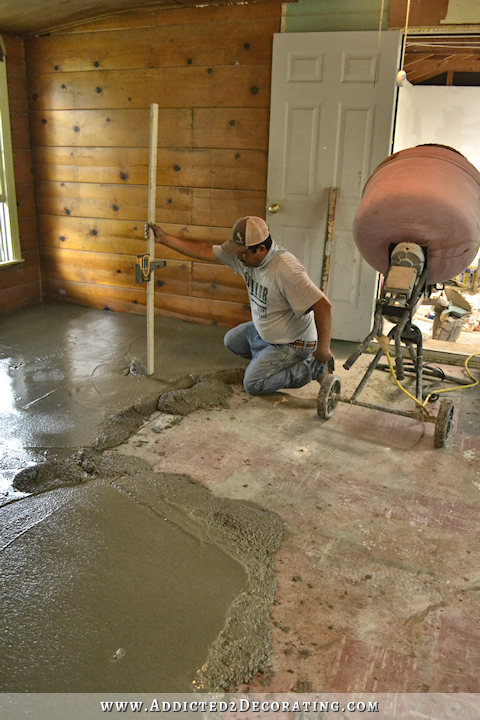 I’ve been planning on doing that for a very long time, but since I had always planned on redoing the floors in each room as I got the remodeling/building projects done, I wanted to wait to install the quarter round until the floors were done. Now that they’re all done, I can go ahead with that. So I do plan to paint the quarter round before installing it, so that I don’t have to paint right next to the floors, but the area where the quarter round meets the baseboards will still need to be caulked and painted, so at that time I’ll do the touchups on the baseboards where I got stain on them. UNbelievable! 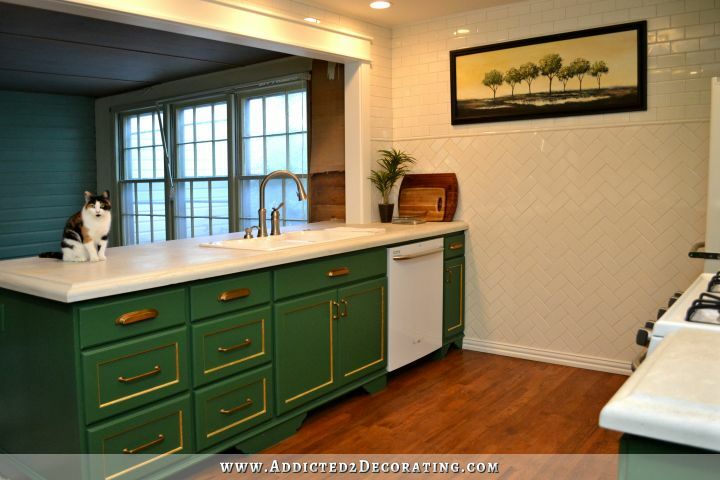 Those floors are GORGEOUS Kristi! I just want to lay down on them, roll around, and caress them – they look so rich and sleek and satiny! I thought they were lovely before, but you’re right, the rich brown is a huge improvement over what was obviously a rather orange hue. As per usual, I remain deeply impressed with your amazing DIY abilities! Honey you should be so proud of yourself. 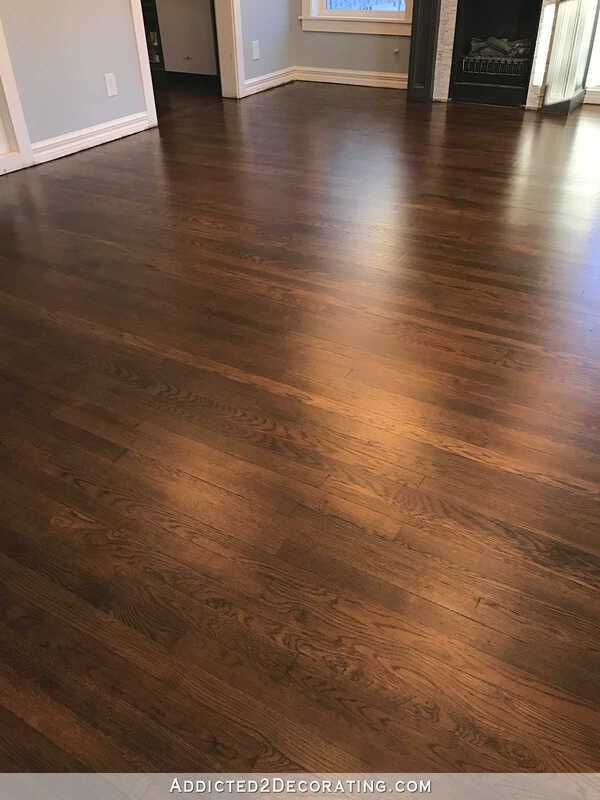 Your home is beautiful and you did a wonderful job on your floors – Congratulations. I can’t wait to see what is next. GORGEOUS! This post is absolutely amazing. I love all the photos showing all the stages. You have done so much in your home…but THIS…this makes all those individual projects show a cohesive plan and it is absolutely stunning. You deserve to feel so proud…you worked hard, and I can’t imagine how amazing it must feel. You are truly an inspiration! Beautiful!!! Such a qualitative difference. Kristi, another major job completed and looking so good. What a difference it makes from how it was. Fabulous work,well done. You have made your house beautiful. Where did you get the clear curtain rods? You do great work! Love the look, classic! Gorge Us!! I love them! Also consider that the width of the plank may change your opinion on different woods. So maybe you don’t like a certain width plank of oak but if you see it in a wider plank you will prefer it. Ditto for maple. The floors look terrific! And it’s amazing to see the before and after photos. You did a fabulous job and should be very proud of yourself. They look great! Definitely a better color! We are trying to pick out hardwoods right now and color is SOOO important to me!! This looks pretty close to my ideal!! Feel free to check out our blog later this year for flooring updates!! The floors turned out beautiful! I didn’t really notice the orange before, but if it bothered you it is so worth it. Great job! I love this stain combo! 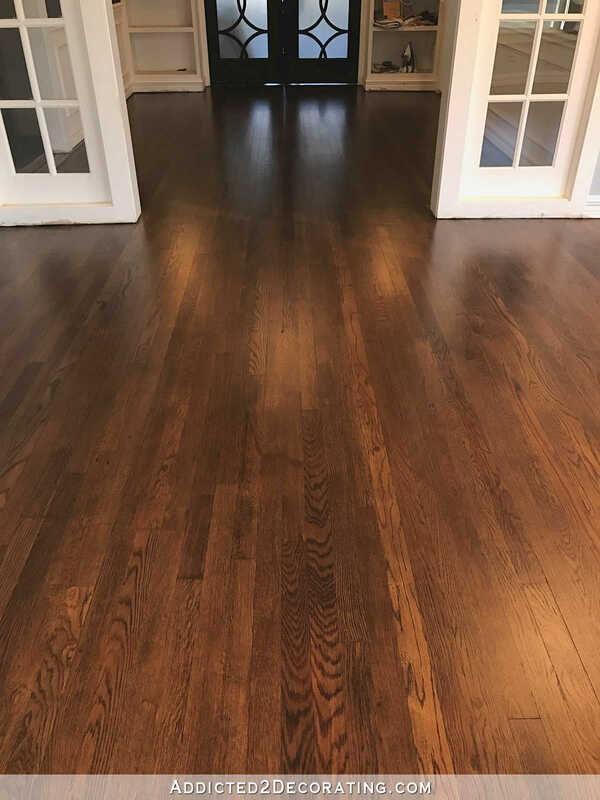 I have red oak flooring throughout my house and would love to use this. I am concerned about it showing dust. My floors now are orangey stained (so over it! ), but the color is great at camouflaging dust. How have you found this color as far as showing dust, etc.? I haven’t noticed dust being a huge problem. I think this color is right in that sweet spot where it’s light enough that it doesn’t show every speck of dust, but it’s dark enough to have some richness to the color. Such a beautiful color! Can you tell me what color stain you used on the floors? I also have red oak and am about to start on refinishing them. Love them! Absolutely stunning transformation! Thank you for sharing the before and after pictures and the details of the process, very helpful for someone considering undertaking a similar project. 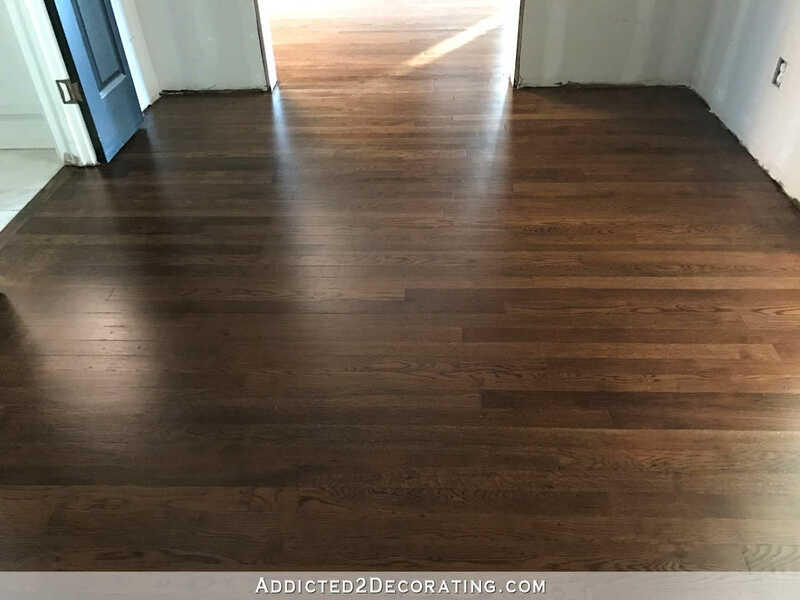 Love, love, love the end product and the stain color for your oak floors. Beautifully done. Thank you for taking the time to post your adventure. It has been a lifesaver for me and my husband! 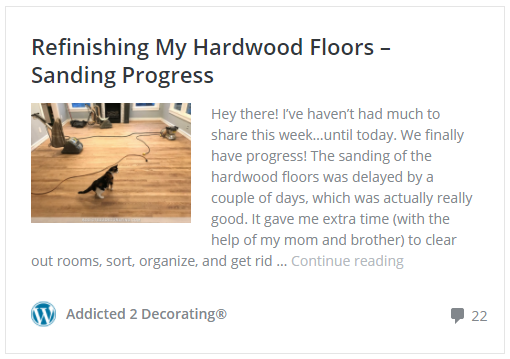 Thank you Kristi, thank you for blogging and posting your steps to refinishing your floors. 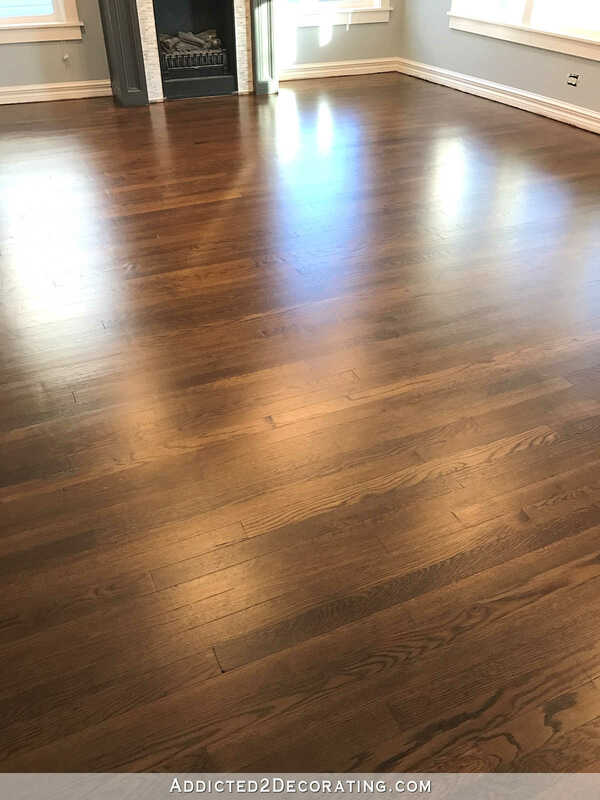 I’ve used your ideas and tips and have now just completed my floors. 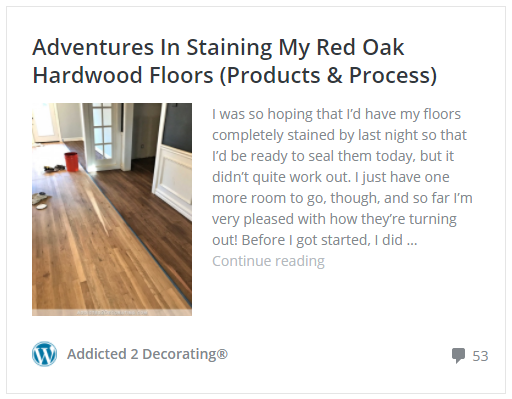 I’ve been searching for the right stain color and keep coming back to your pics/post, your floors are beautiful! Do you think the poly/stain mix would work with a matte poly? Yes, I think it would work. Just be sure you’re mixing oil-based stain with oil-based poly. Absolutely gorgeous!!! 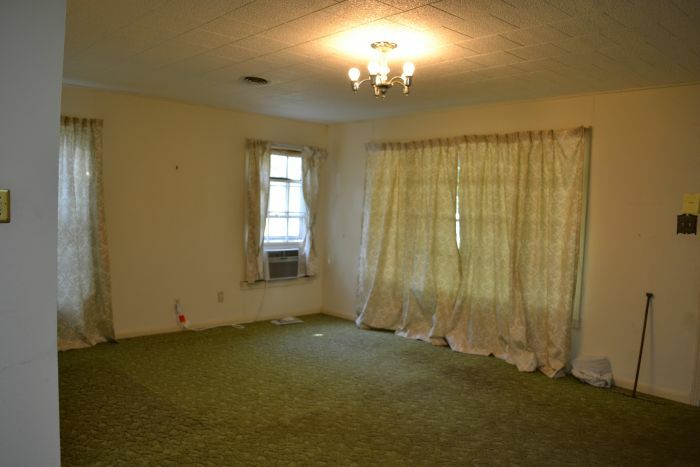 We had a very similar thing where we bought the house with floors that were covered in hideous carpeting and the orange hardwoods were underneath. We’ve lived with those for _12 YEARS_ and are getting them refinished finally in a month! I’ve been researching stain ideas and I think I’m going to show my contractor this post because our starting colors are so similar and your ending color is exactly what I want. Really nice job doing this yourself. I am in awe!!! Hi there, your floors look amazing! I wondering how the upkeep has been? I am having my floors done next week and love your color but am a little nervous it will show everything. Wondering your thoughts? It probably shows more than a lighter floor would, but I’m okay with the trade off. I much prefer the warmth of a darker wood color.